There are no guarantees in life except, in the United States, the quest of life, liberty and the pursuit of happiness. Oh, let's not forget Death and California taxes! However, there are those who believe life should guarantee you a job with benefits and even tenure, a guaranteed job. Where's your confidence? Aren't you a great employee? Over time, you have showboated the fact that you are frugal for the citizens of California. You have said these would be frugal and austere years for Californians. There are reports that you may close more than 15 governor's offices around the state. You have said you plan to eliminate 46,000 cell phones from state workers. I say "may" because it hasn’t happened to my knowledge yet. But, is it all talk for the news media? Just lip service to restraint in this rotten California economy? Through Facebook, during your gubernatorial campaign I asked you and Meg Whitman to be fiscally honest and accountable and to post all the state's finances to the web on a daily basis, starting with your governor's office and the California Lottery. Let's see the numbers. Post the Finances Daily. but are you really different this third time as governor? Time will tell. But history shows politicians don't change their spots. 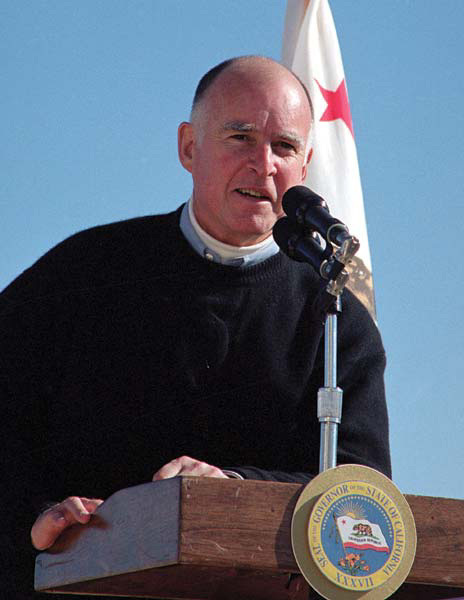 Nevertheless, I would like to congratulate you on becoming governor of this great state of California for the third time and I appreciated the frugality of your inauguration. And, even though I had high hopes for former Governor Schwarzenegger and first lady Maria Shriver, a Republican and Democrat, clearly working together, I was greatly disappointed they didn't have the guts to post the state's finances. Please don't let us down. Maybe a Democrat will do it, but it is more likely a Republican will be the first to implement my plan. As you know, many thousands of us Californians, along with the state of California, are struggling to get out of a serious financial disaster. You were known for your frugality. I urge you now to take the next logical step in restoring the fiscal health of California and make the necessary cuts and especially post the state's finances daily to the web. Also, I appreciate your willingness to throw back services to the counties and cities but are you just kicking the can of fiscal transparency down the road? It's like telling your soldiers to scatter so the bomb of fiscal transparency won't get them. But it will, and it may be sooner rather than later. I wish I could have had you throw your political weight behind the Post the Finances initiative, officially known as "State Revenue and Expenditures. Initiative Statute," which I pioneered back in the early 2000s. This initiative called for all Californian government departments and agencies to post all of their finances, every day, to the Internet like an online checking account. By the way, just as an aside, the manipulation of wording done by the legal staff of the State was horrifying. Call this initiative what it is: The "State Shows Us All Our Money Law". It's interesting to note that our local newspapers write to the reading level of the average 6th grader, while initiatives and laws are written for lawyers and legal scholars who want to manipulate the masses and obfuscate in order to do so, but at times don't understand these laws completely themselves. Hey, K. I. S. S. Keep it Simple, Stupid. Post the Finances is like a daily, on-demand people's audit. It will reduce wasteful spending, fraud, duplicity and corruption in California's Government. In the wake of the scandal in the city of Bell, California, politicians and bureaucrats are realizing that they can no longer play around with the taxpayers' money, because the taxpayers will be able to watch their every move. It's not a matter of if but when posting the finances will happen. Will it happen under your watch? Post the Finances will provide an unprecedented opportunity for citizen oversight of their own government. After all, it is our money that funds the government and we have the right to know how it is being spent. In addition to your promise to audit the books, you have also stated that if the legislature refuses to break out of its habitual gridlock, you will create referendums or initiatives to bypass the legislature in the interests of the people of California. Post the Finances, which has been resisted by the Sacramento political establishment, is surely an initiative that merits your support. I, along with millions of other Californians, believe that you are on the side of the people of California, not the ideologues on either side or the vested financial interests. I believe that Post the Finances is a reform that cannot be delayed. It is in the best interests of every resident of California, and I urge you to give your full support to the initiative officially known as "State Revenue and Expenditures. Initiative Statute." Will you use your next press conference to publicly endorse it? Everywhere I go in California I meet with enthusiastic support for this initiative. An endorsement from you, the Governor of California, would show everyone that you mean what you say about openness in government. The wise leader listens to what the people are saying. And more and more people in California are saying, "Post the Finances for Fiscal Honesty." Can we rely on you, the new governor of our state, to hear us? And may I have an appointment with you to discuss my idea in more detail?